Global GDP today is an estimated $75 trillion, of which Europe’s GDP is about $20 trillion and Asia’s is nearly $30 trillion. Of the almost 2 billion people who are expected to join the global middle class in the next decade, 85 percent live in China and India. The resulting growth in consumer demand offers a great opportunity for Central Asian countries to create new markets. This is especially true of Kazakhstan, which is located smack in the center of China’s “new Silk Road”—the broad infrastructure and market-building initiative linking Asia to Europe. The big question is how to quickly realize this potential. A team of people from the World Bank and the International Finance Corporation (IFC), with support from Duke University, tried to answer this question, reported in the World Bank Group’s Country Private Sector Diagnostic for Kazakhstan. The short answer: it will depend on Kazakhstan’s private markets, but its government can help a lot—or hinder greatly. Kazakhstan, an upper-middle-income economy, hopes to quickly get to high-income levels. It depends on oil; in 2013, before oil prices dropped by half, much of its exports and government revenues came from oil and gas. With a GDP per capita of just over $7,500 (2016, nominal), Kazakhstan could reach high-income status within a decade if its economy grows at about 7 percent annually. To do this, it will have to do more than just exploit and export natural resources. A structural shift in the economy toward greater competitiveness in non-energy tradable goods and services will be needed, but it will have to be brought about by investments in productivity, human capital, and innovation, not merely by pumping oil and gas rents into non-extractive businesses. Identifying sectors with greatest market potential that—if realized—would have the greatest impact on development objectives. Providing an assessment of what is preventing the realization of market potential. Indicating the activities that should be prioritized to meet the double bottom line of development impact and private profitability. Based on the government’s 2030 strategy and 2020 plan, Kazakhstan’s development objectives are to increase diversification, employment, and productivity. Since the work was sponsored by the IFC, the task was essentially to put into use the IFC 3.0 Strategy in Kazakhstan. This meant identifying the markets with the greatest potential to help meet the country’s development objectives. The assessment indicated that the sectors with sizable unrealized development and market potential are grains, meat, and cross-Kazakhstan transport. The market potential assessment relied on quantitative tools (multiplier models, product space, and competitiveness benchmarking), expert interviews, and a survey of policy reports. The development impact assessment was largely heuristic, though the team carried out a fuller analysis of one measure of market potential (GDP) and one development objective (employment). 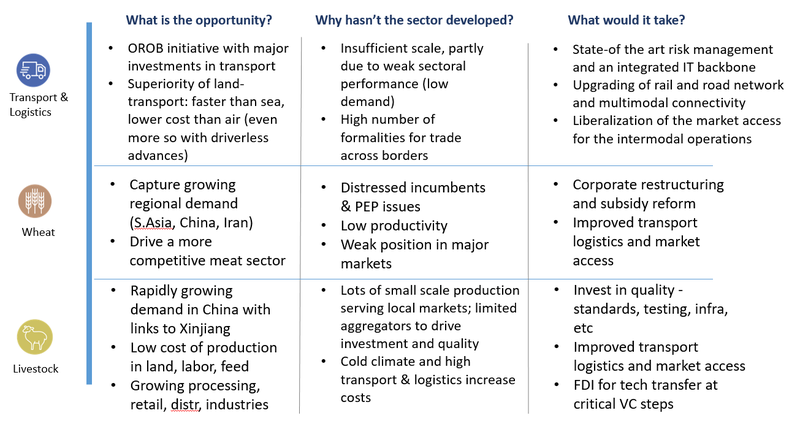 Finally, for each of the three sectors, we estimated the market potential, identified critical investments and policy reforms, and suggested the key market players. 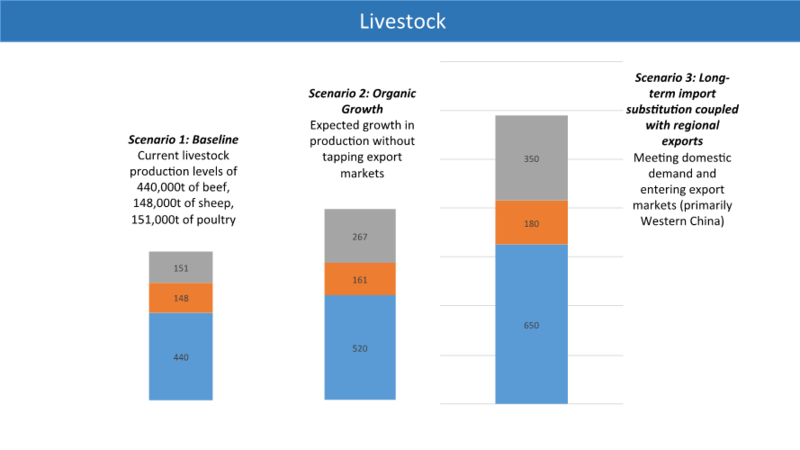 “Deep dives” for grains, meat, and cross-Kazakhstan logistics provided estimates of current and potential market size by sub sector (e.g., beef, sheep, and chicken for the meat sector). 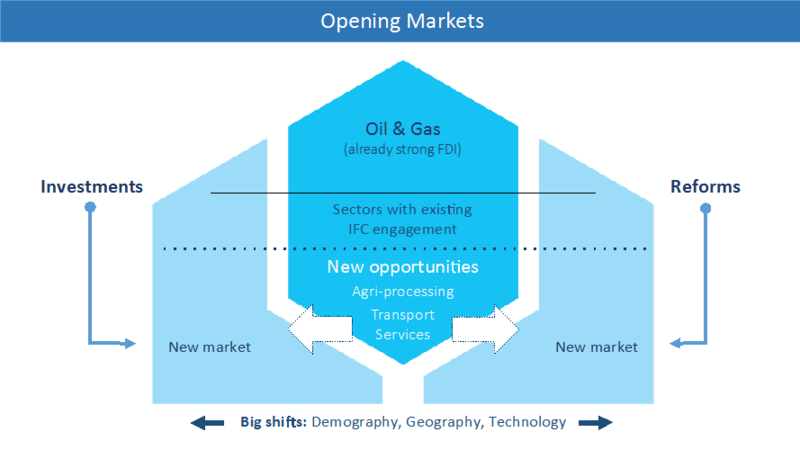 Based on analysis by industry experts, they essentially provide the elements of a strategy for each of these three sectors. The sector analysis included a cataloging of the key players and helped toward identifying promising investments, loans, and other activities for the IFC to consider, and the institutional reforms and infrastructure gaps for the World Bank and others to take up in their discussions with government. Wheat. Wheat is a staple consumed by all segments of society, rich and poor alike and the growing middle-class consumption across Asia, especially in China, will drive up demand for wheat. 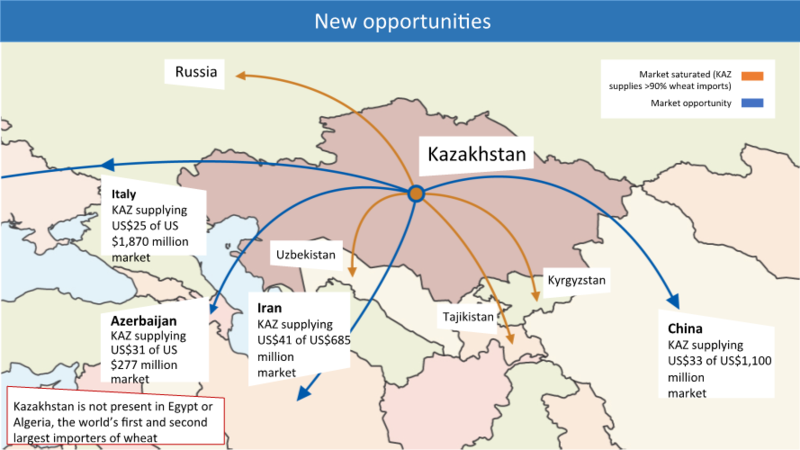 Kazakhstan, as one the world’s major wheat producers, stands to benefit by tapping into these new markets, but only if export competitiveness can be improved (Figure 2). Kazakhstan is currently the least productive of all major global producers, with less than half the average yields per hectare of countries like Canada and Russia. Livestock. As the size of the middle class in China and South Asia continues to grow rapidly, demand for more expensive meat products will expand. With vast expanses of rangeland, availability of feed (including wheat), low production costs and close proximity to potential markets, Kazakhstan is well-positioned to expand its livestock exports and livestock food-processing industry. Transport and logistics. Kazakhstan is a natural transit corridor of the new Silk Road, and rail and road transport will see a revival due to the westward shift of production in China away from the more expensive east of the country. Currently, Kazakhstan is only scratching the surface of the potential for container-based trade between China and the European Union, with just 1 percent of the total transiting the country. 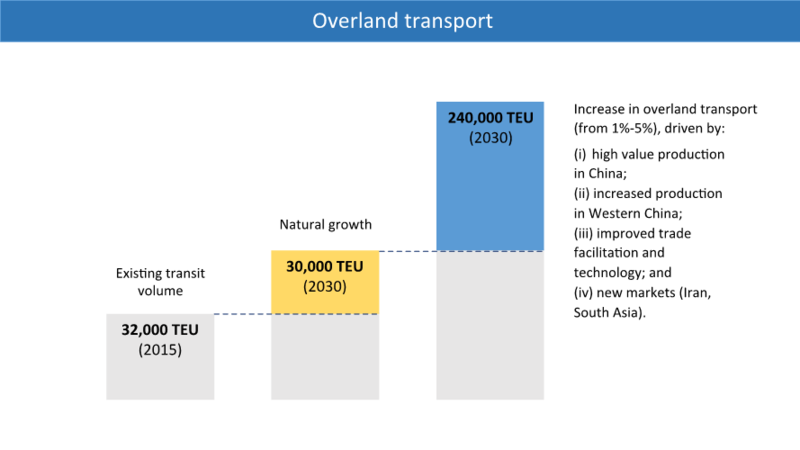 With trade facilitation reforms and technological innovations (for example, semi-autonomous vehicles), transport time and costs could be dramatically reduced, making the option of transiting through Kazakhstan far more attractive. There are obstacles at the economy wide and sector level that will need to be removed to create new markets. We tried to identify how to remove them through deep-dives. The countrywide issues relate largely to constraints in the business climate for the private sector including a complex regulatory environment, concerns with governance and informality, and the stifling dominance of state-owned enterprises. These deter investment, undermine corporate governance and render cross-border trade inefficient and costly. 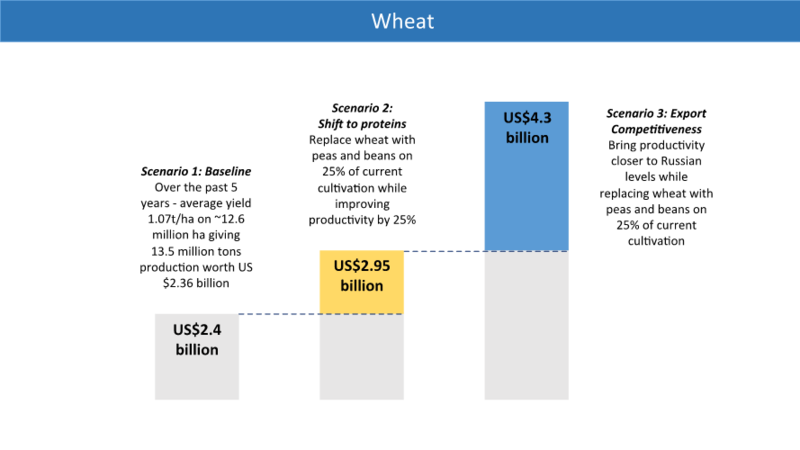 In wheat, corporate restructuring and subsidy reform will be necessary to attract private investment and usher in badly needed productivity improvements. Improved transport and logistics and market access by facilitating trade would increase the competitiveness of Kazakhstan’s enterprises and to penetrate new markets and value chains. In the livestock sector, for Kazakhstan to become a successful regional player it will need to invest in quality improvements, such as testing and monitoring to meet international quality and phytosanitary standards. As with wheat, the livestock sector needs better transport and logistics, streamlined procedures, and other measures to facilitate trade. In the transport and logistics sector, investment in state-of-the-art risk management systems and an integrated information technology backbone will be essential to reduce costs and speed up the movement of goods. The upgrading of rail and road networks and the introduction of seamless multimodal connectivity is necessary for Kazakhstan to compete not just in agro-processing, but also more generally to position itself as a viable transit route between China and Western Europe. This will require liberalization of markets for advanced players in intermodal logistics operations. As a result of the reforms needed, the “shovel readiness” of the investments differs by sector: It is greatest for grains, somewhat less for meat, and least for transport (Figure 4). Kazakhstan can rekindle economic growth and achieve its development ambitions by enabling markets in ways that increase productivity and export competitiveness. Based on analysis, experience and conversations with market players, wheat, livestock, and transport and logistics seem to be the markets with greatest potential. Investment in these activities promises both private profit and development dividends—more jobs, greater productivity, and lower volatility.